TOKYO, Nov 23, 2018 – (JCN Newswire) – Mitsubishi Electric Corporation (TOKYO: 6503) and NTT DOCOMO, INC. (TOKYO: 9437) announced today that they have achieved what they believe to be the world’s first (as of today) fifth-generation (5G) mobile telecommunications proof of concept for 27Gbps and 25Gbps maximum throughputs via one mobile terminal over communication distances of 10m and 100m, respectively, using the 28GHz radio frequency. The demonstration was conducted during joint outdoor field trials using 28GHz-band massive-element antenna systems and 16-beam spatial-multiplexing technology with 500MHz bandwidth. The trial took place in Kamakura, Kanagawa Prefecture Japan from September 10 to 28, 2018. For outdoor trials using the 28GHz band, Mitsubishi Electric used an antenna system with 16-beam spatial-multiplexing technology(1). Base-station antennas installed on the wall of a building directed beams to mobile-terminal antennas installed on the rooftop of a vehicle. The trial was the world’s first successful wireless downlink transmission at maximum data rates of 27Gbps and 25Gbps for per one mobile terminal when the communication distance was 10m and 100m, respectively. Indoor trials using 28GHz band in multipath-rich environments during fiscal year ending March 31, 2019. A peak data rate of 20Gbps is required for 5G mobile communications. One technology that promise to meet this need is massive-element antenna systems technology, which enables multi-beam spatial multiplexing where multiple data streams can be transmitted in parallel to mobile terminals. Realizing this technology, however, has involved two challenges: implementation of a massive-element antenna array that clusters large numbers of antenna elements for high-precision beamforming, and mitigation of inter-beam interference. Mitsubishi Electric and DOCOMO have jointly undertaken “The research and development project for realization of the fifth-generation mobile communications system – High data rate and low-power-consumption radio access technologies with higher-frequency-band and wider-bandwidth massive MIMO” commissioned by Japan’s Ministry of Internal Affairs and Communications. The focus of their research has been wideband massive MIMO and beam-control technologies for high SHF bands. To realize 20Gbps throughput using 500MHz bandwidth, they have now collaboratively developed and validated a massive-element antenna system enabling 16-beam spatial multiplexing. Using 4G systems, it has not been possible to establish high data-rate communication for a single mobile terminal using more than four streams. 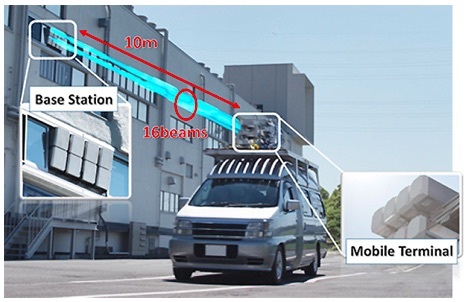 Mitsubishi Electric and DOCOMO carried out 28GHz-band outdoor field trials to verify the feasibility of 16-beam spatial multiplexing in line-of-sight conditions(4), where massive-element base-station antennas installed on the wall of a building directed beams to mobile-terminal antennas installed on the rooftop of a vehicle. The mobile terminal moved along two different streets. The distance of one mobile terminal was 10m from the base station and the distance for the other was 100m (Fig. 1). This news release includes a part of “The research and development project for realization of the fifth generation mobile communications system” commissioned by Japan’s Ministry of Internal Affairs and Communications. 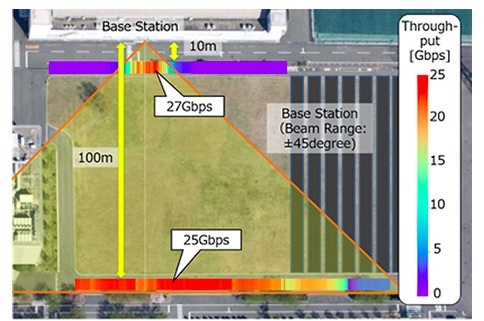 Conventional 4G spatial multiplexing technology has limited multiplexing order, so Mitsubishi Electric and DOCOMO developed beamforming technology in an analog domain and inter-beam interference reduction technology to suitably separate overlapping beams with digital signal processing at the base station. The result is 16-beam spatial multiplexing, which has been unachievable with 4G. The developed beamforming technology enables beams to track a mobile terminal by switching the preset beam (Fig. 2). The inter-beam interference reduction technology estimates the channel at the base station and controls the transmitting signal to adaptively reduce inter-beam interference as channel conditions over time. Together, the two technologies enable 16-beam spatial multiplexing in outdoor mobile environments. The trials achieved the world’s first successful wireless downlink transmissions at data rates of 27Gbps and 25Gbps when the distance between the base station and the mobile terminal was 10m and 100m, respectively. The achieved peak data rates correspond to spectral efficiency of 67bps/Hz5, believed to be the world’s best performance for 28GHz-band mobile telecommunication. (4) There was no obstacle between the base station and device. The environment for parallel transmission was challenging. NTT DOCOMO, Japan’s leading mobile operator with over 76 million subscriptions, is one of the world’s foremost contributors to 3G, 4G and 5G mobile network technologies. Beyond core communications services, DOCOMO is challenging new frontiers in collaboration with a growing number of entities (“+d” partners), creating exciting and convenient value-added services that change the way people live and work. Under a medium-term plan toward 2020 and beyond, DOCOMO is pioneering a leading-edge 5G network to facilitate innovative services that will amaze and inspire customers beyond their expectations. DOCOMO is listed on the Tokyo Stock Exchange (9437). https://www.nttdocomo.co.jp/english/.